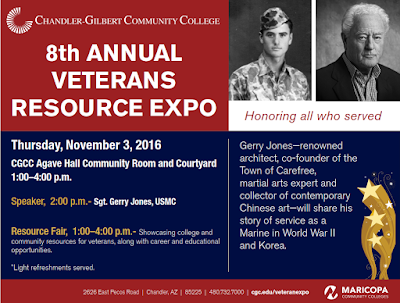 Chandler-Gilbert Community College’s (CGCC) 8th Annual Veterans Resource Expo will be held Thursday, November 3rd from 1 to 4 p.m. at CGCC’s Pecos campus. 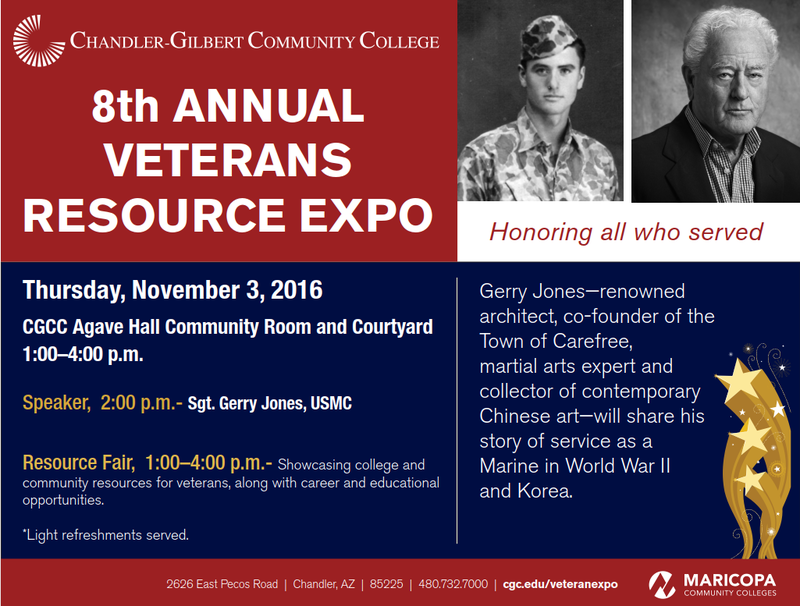 The event features a resource fair with over 30 college and community groups serving veterans along with a guest speaker program. This year's speaker is Sgt. Gerry Jones, an internationally-known architect and builder of more than 300 luxury homes (primarily in Arizona), as well as martial arts expert, co-founder of the town of Carefree and holder of the world’s largest private collection of contemporary Chinese art. Sgt. Jones will speak about his experiences as a Marine sniper/scout during World War II, and his additional service during the Korean War teaching self-defense skills to Marines. Exhibitors from a variety of government and community groups as well as businesses and organizations looking to hire veterans will have tables at the Expo. Among these are the VA and VA Healthcare, VA Vet Centers, Arizona Department of Veterans Services, VFW, American Legion, Veterans Stand-Down and Department of Economic Security and employers such as Home Depot, Chandler Police Department and Phoenix-Mesa Gateway Airport. Arizona State University and Northern Arizona University will also have their military outreach specialists in attendance to speak with students about transferring. The 8th Annual Veterans Expo will be held inside the Agave Building Community Room at the Pecos Campus located at 2626 E. Pecos Rd. from 1 to 4 p.m. Sgt. Jones will address attendees at 2 p.m. The event is free and open to the public, particularly student and local veterans. Complimentary refreshments will be served.